These days Facebook is one of the heaviest engine of advertising, many companies use Facebook to promote their products and even hire people to deal just with that. because a new bages will have a new "bid" so every website will drop the old badge. 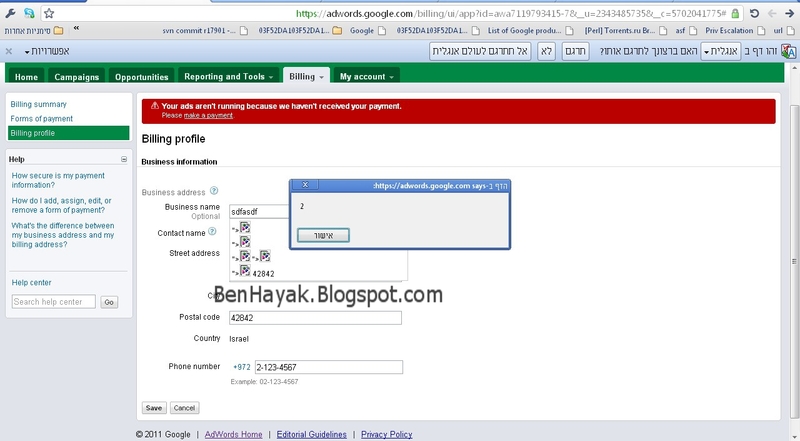 and manipulate the "bid" and "owner_id"
Google Adwords Google's Online Advertising service, boost website traffic and sales, was vulnerable to a persistent XSS in the Billing information. The Billing information details was vulnerable to a persistent xss in 5 different fields. both Street Addresses, and City. This attack was performed by editing the billing information with the right xss payload (no special bypass required). This XSS is so persistent that it isn't possible even for the administrator to delete the poisoned billing information.